One...two...ready...GO! Play 20+ games from the double-deck combinations of colour and rhythm cards. Add a boom to recreational and educational music-making. Perfect for families, classrooms, and large or small groups. The colour cards use the the Chroma-Notes™ colours that match the very popular C Major Diatonic Scale Set of Boomwhackers Tuned Percussion Tubes. 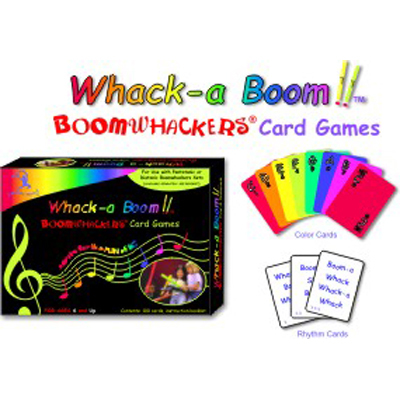 For use with Pentatonic or Diatonic Boomwhackers sets. Contains 48 colour cards, 48 rhythm cards, 2 wild cards, 2 music word cards, game instruction booklet.